MARTICORENA (P.), ARD (V.), HASLER (A. ), CAULIEZ (J. ), GILABERT (C.) et SÉNÉPART (I. ), 2018. 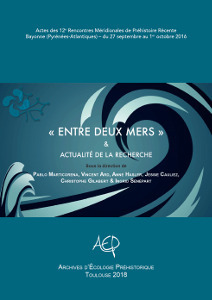 « Entre deux mers » & Actualité de la recherche. Actes des 12e Rencontres Méridionales de Préhistoire Récente, Bayonne (Pyrénées-Atlantiques), 27 septembre – 1er octobre 2016. Archives d’Écologie Préhistorique, Toulouse, 2018, 370 p., ISBN 978-2-35842-025-9. By organizing the 12th Rencontres Méridionales de Préhistoire Récente at Bayonne in 2016, we wanted to focus on the South-Western France, a region often absent from national syntheses and struggling to attract the attention of researchers. Contributions to the thematic session, « Entre deux mers », highlight a geographical space between the Atlantic and Mediterranean coasts, from the Mesolithic to the early Bronze Age, through synthetic studies based on the most recent discoveries. These studies also offer the rare opportunity to put into perspective the data from the to slopes of the Pyrenees. As usual, the thematic session is followed by papers on research news offering a panorama of recent discoveries dated from the Recent Prehistory in Southern France. Theses news are divided into two parts, the first focused on this region and the second on the scale of the Midi.